I love it that you love it!!! 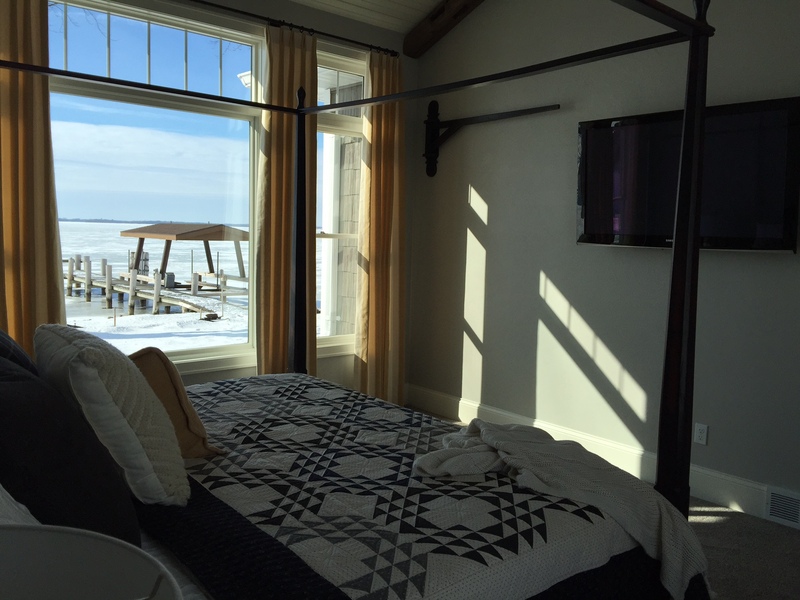 The bedrooms are beautiful. I’m guessing the whole house oozes with love! Beautiful! 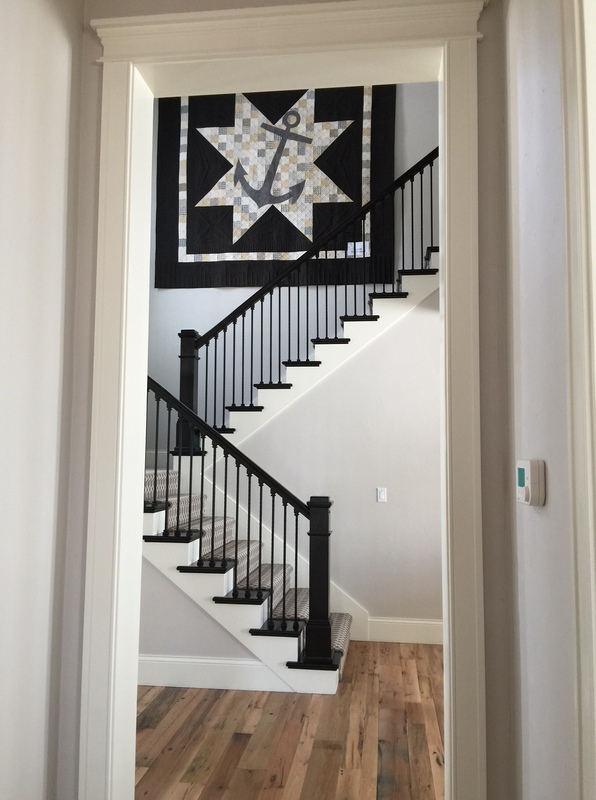 Love the look of your home. Many relaxing and wonderful memories will be made here. Thanks for sharing with us. Oh, my goodness, your new home is lovely! I don’t even have to see the rest of it to know I love the whole thing. No wonder you had tears of joy when you saw it. Beautiful!!! —and peaceful! Love everything I see. BEAUTIFUL LISA!!! IT’S AMAZING!!!! ENJOY! YOU’VE WORKED HARD FOR IT!!! It is so calming…….very lovely…the view from your bed is the best. Thanks for sharing. Simply amazing Lisa. Can’t wait to see more with your touches to it. You and your family deserve this so much. Enjoy! SOOOOO beautiful! Thanks for sharing your pictures! Your new home is wonderful, beautiful and well deserved. And the quilts truly make your house a home! Enjoy it for years to come, Lisa! Congratulations. Amazing! You are so blessed and deserving. Thank you for sharing your treasure! Love the house pics Lisa! Thanks for sharing :). Enjoy your new house! All I can say is Beautiful!! Thanks for sharing. Love the pics. Your house is beautiful Lisa. Thank-you for sharing. The Lakeside quilts look perfect there. Bet it is hard to leave such a beautiful, peaceful, place. I am still out in Tucson helping with grandkids while my son and daughter-in-law are in Phoenix with baby Halle. Thank-you for your prayers for her. She did amazing during her surgery yesterday. Very beautiful home! Appreciate you sharing it with us. Prayers for a happy and peaceful life there. Your new home is beautiful! So calming and inviting! Your new home is lovely, I hope you build many years of happy memories there at the lake. You and Nick both work so hard, you deserve this. Thanks for sharing…. Thank you so much for sharing your beautiful new home with all of us. You and Nick have done a remarkable and beautiful job decorating and designing your home. I wish you much happiness there. Breathtaking! Love the flow! I am really looking forward to kitchen and bathroom photos…I’m trying to design and addition that glows and the bathroom has me stumped! Lisa, your new home is beautiful! Congratulations, again. 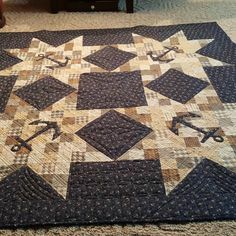 It is so amazing, and your quilts are perfect there. May you and Nick have many, many wonderful years there making special memories! Great house, best of the parade. Inspired us, love that swinging pantry door and back entry desk area. Thanks for the update, Lisa. Your house is beautiful. Enjoy it!! So happy for you and your beautiful new home. There is nothing like living next to water. I am so thrilled for you. What a warm and welcoming place to call home! All I can say is Wow! A dream house, absolutely gorgeous! Well done and very deserved, you guys work so hard. Enjoy! Wow, So beautiful! Love everything about it! Can’t wait to see more pictures! You and yours deserve every bit for working so hard and being so kind to all! The best to you! (How did you finish those fabulous wood floors? Are they oil finished?) Thanks for sharing with us all! 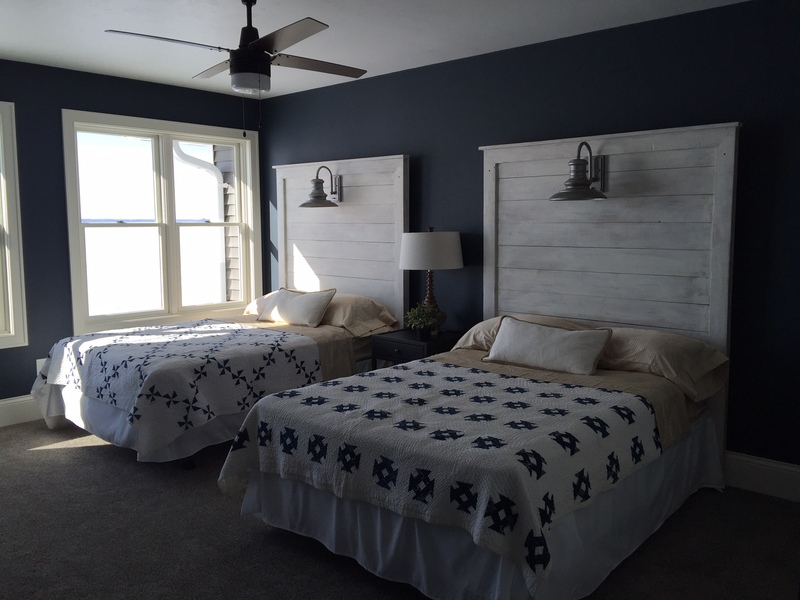 I can’t seem to find the Lakeside quilts on your website 😦 I was also wondering if you know the name of the blue and white quilt pattern that is on the master bedroom bed? Thanks! Hi Tina! Click the link in Lisa’s post above that says “Anchor Point” or go to the Primitive Gatherings website and they are in the “On Sale” category under “Kits”. Such pretty colors. 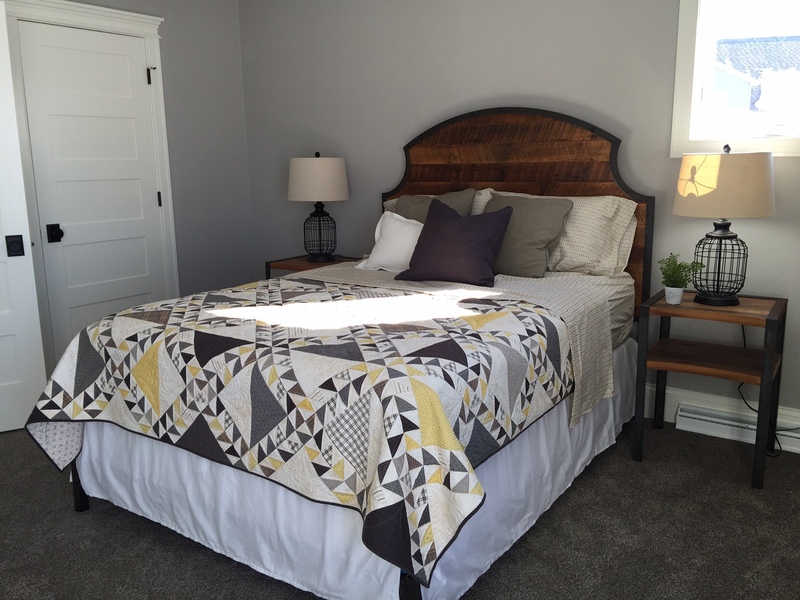 It looks like the quilt on the master bedroom bed is Winneconne Waves which is on sale. So pretty! I also wanted to know the quilt pattern you used in the master bedroom. Thanks. The house is so very beautiful. I lovvvve the staircase. I can just see a large beautiful garland for Christmas. 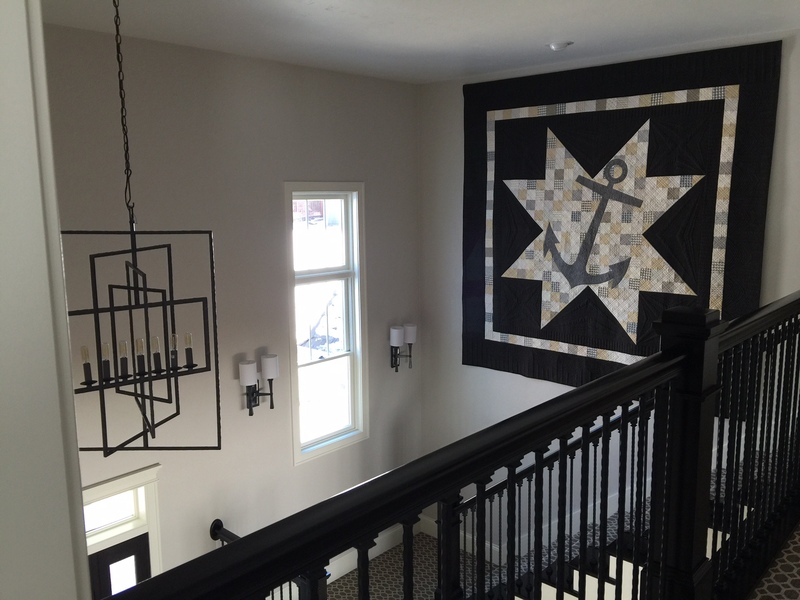 Your new home is beautiful and love the quilts used thruout! Lisa, Thank you for sharing your beautiful new home with us. So very happy for you and Nick! Beautiful house. Can you share some of the interior paint colors you used? 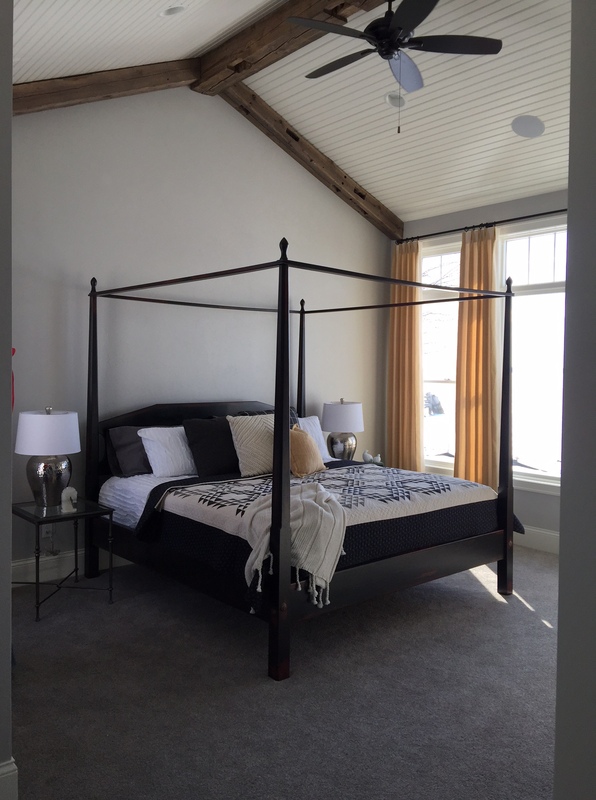 Sue D.
Your home is simply beautiful…..can’t wait to see what you have done with the rest of the house. Great memories to be made there for sure. Just wondering if you had any of your things from your other home for sale such as furniture that doesn’t go with your new décor? Beautiful house for a beautiful family. So many memories to be made. Was just wondering if you are selling anything from the other house that doesn’t fit in in your new house??? You have built a beautiful home which reflects all your hard work. Keep the pictures coming.